DUE TO CIRCUMSTANCES OUT OF OUR CONTROL: Jordan Luke Gage will not appear at this second date. Jordan Luke Gage played Strat in Bat Out Of Hell The Musical and will be joined by West End performer Kyle Roberts. Kyle has a strong vocal performance along with a strong fan base and we can’t wait to work with him not just only on 19th July 2019 but other dates throughout 2019. ABOUT KYLE: Kyle Roberts is from Newcastle where he began his training under the direction of Emma Roberts at Buzz Dance Company, After completing his 3 Year diploma course at Masters Performing Arts in Essex, Kyle joined Bat Out Of Hell The Musical, his first job upon graduating in 2018. 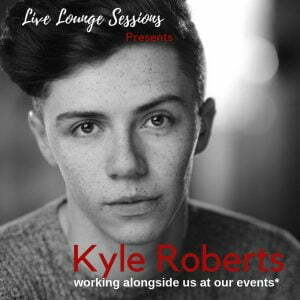 Kyle will be joined by a selection of local talent who will lead the way in this special Live Lounge Sessions. Join us! For a night of great music! *Please note: No meet and greet at this event, however we will hopefully ensure time for a photo with the performers after the show has finished. ACCESSBLITY REQUESTS: We understand that everyone’s needs are different, so please before booking check with us, or the venue about your accessibility needs. NOTE tickets are NOT being sold directly on the Chapel Arts site.